A UX Lab (or usability lab) is used for usability testing and user experience research. Users are observed in a specific environment while interacting with a product or system. Their interactions are important, as the usability of a product or system is key to its success. Most UX research is conducted in state-of-the-art UX labs. Over the past few years we’ve been involved in some of the most amazing UX labs. From gaming research labs to modern social media labs and purpose-built usability testing labs. Let me share three recent examples of UX labs that we’ve helped establish in recent years, including the latest UX research tools. Home to some of the world’s tallest buildings and most luxurious hotels, Dubai is increasingly becoming a smart city where technological innovation is key. 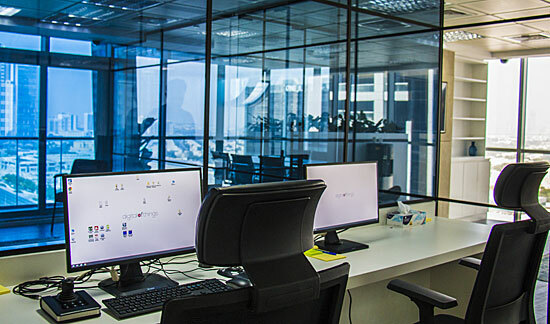 User experience experts Digital of Things identified the growing need for good UX in the region and established the UAE’s first purpose-built, state-of-the-art usability testing lab. The Digital of Things usability lab is a high-tech user testing lab with world class analytical features, including facial expression analysis with FaceReader. Together with Noldus, they've set up an ultra-modern usability lab, equipped with the most advanced software for user experience testing. The lab has a comfortable living room atmosphere so testers feel at home, ensuring reliable results from user testing. Thanks to the one-way mirror, cameras and microphones in each room, testers are observed unobtrusively. These lab facilities and their expertise enable Digital of Things to combine quantitative data with qualitative insights, and provide their clients with useful recommendations. Closer to home, we’ve set up a lab that is adapted to our modern digital world. Everybody uses social networks like Facebook and Instagram, but are not really aware of how their data is used. The Social Media Lab in Mons, Belgium brings together researchers, students, and professionals from different disciplines as communication, marketing, journalism, computer science, and more. Together they try to understand the digital world, train themselves in the use of new technology, and learn more and advice about new professional practices. They conduct tests to find out how people make sense of data, and data visualizations. They use tools like The Observer XT for easy data integration and behavior analysis, and MediaRecorder for synchronous AV recording. The Social Media Lab at the University of Louvain uses Noldus' software to integrate different data streams and set up experiments. Most recently we teamed up with the Tech3Lab at HEC Montréal. Prof. Pierre-Majorique Léger tells more about user experience research, and how to measure users' interactions with technology in the video below. Thanks to research in their UX lab, they've designed a new technology compatible with Noldus tools: CubeHX, a revolutionary new tool for UX-research. This cloud-based software platform combines behavioral data collected from human behavior research in order to provide fast and rich insights to professionals developing human experiences. Cognitive and emotional data collected during user experience tests are usually visualized into heat maps. Going beyond traditional gaze heat maps used in eye tracking, CubeHX captures the complete user experience. Thanks to the triangulation of facial expressions, physical reactions, and eye tracking data, CubeHX provides UX researchers and designers with unique insights on what generates emotion or cognitive load on their interface. The world of user experience research is always developing and we can't wait to see what other usability and UX labs will be set up in the future! To get off to a good start, it is best to describe the research or tests in great detail. With this description it becomes clear what kind of equipment will be needed, and which physical environment would best suit this test or research. Download this free ‘how to’ guide to learn more about building a usability lab.